With the rising costs of healthcare in America, companies are left grappling with one universal dilemma: How to provide quality health benefits to its employees while keeping medical trend down. According to the Society for Human Resource Management, the average cost of employer-provided health insurance will rise six percent in 2019 to reach nearly $15,000 per employee, with employers paying 70 percent. Consequently, employers are partnering with third-party companies, like Grand Rounds, to maximize their benefits, improve outcomes, and lower overall health plan costs for their organizations. Grand Rounds is a new kind of healthcare company. Using actionable data and a clinician-led, award-winning care team, Grand Rounds raises the standard of healthcare for members and their families. Employers who partner with Grand Rounds are providing a higher quality of care for their employees, inevitably decreasing spend on unnecessary procedures, over-prescribed pharmaceuticals, and excessive doctors’ visits and insurance claims. Connect members with higher quality care. Grand Rounds’ digital navigation platform gives employees the insight and data they need to select highly qualified doctors right from the start. Employers benefit by having healthier workers who require less sick leave and fewer procedures. Navigate complex members to the right care. For members with serious conditions, Grand Rounds’ intensive care coordination is an important tool to both improve health outcomes and mitigate costs. Reduce clinically unnecessary procedures. Misdiagnoses, unnecessary treatments, and ineffective care drive spend without delivering better health outcomes. Grand Rounds’ expert second opinion service helps ensure employees will get the care they actually need. Help employees understand their treatment options. Being diagnosed with an illness can cause confusion around what next steps should be. 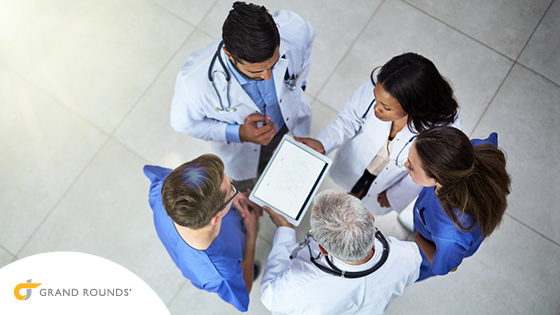 Providing fast access to Grand Rounds’ dedicated team of clinicians to discuss diagnoses, symptoms, and treatment plan options can help employees make the right healthcare decisions. Increase transparency around benefits and cost. Let’s face it: Most employees don’t understand the benefits available to them. 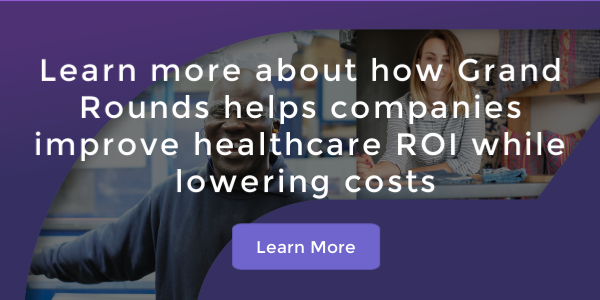 Grand Rounds’ care coordinators, and their sophisticated financial guidance tools help employees understand their benefits, compare costs for procedures, avoid out-of-network care, and evaluate their healthcare options. Cutting your medical cost trend can be challenging. And while employers admittedly take on the brunt of the financial burden, employees suffer financially and medically from getting inadequate care. Grand Rounds helps alleviate it all.